How I Started Collecting: Since I always took great care of my play dolls, my parents decided to start purchasing collectible dolls for me, at an early age. As the years progressed, my collection blossomed. My Collection: I collect all types of Black dolls made in a variety of mediums. The range is broad, from play dolls to artists OOAKs. 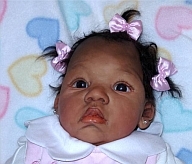 Favorite Dolls: Amalya, an OOAK baby by Lorna Miller-Sands. Amalya is my dream doll! Suggestion to New Collectors: Only buy dolls that you truly like. Don’t get caught up in the “I have to have the entire series” or “someday this doll will be worth a lot of money” syndromes. If I don’t like all of the dolls in a series, I only buy the ones that I like. I believe the reason I am able to constantly enjoy my collection is the fact that I only buy what I truly like. If I don’t immediately connect with a doll, I won’t buy it. Purchase good doll reference books and make informed purchases. Don’t get caught up in bidding wars. Pay only what the doll is worth to YOU. Remember, if a doll is meant for you to have it, you will get it eventually. Other Collector News to Share: Several of my dolls have been published in doll reference books. I have had the opportunity to meet some of the best doll artists in the world, including my favorite artist, Lorna Miller-Sands. Not only is she an amazingly talented artist, she is a very kind and remarkable friend.